The workshop was interesting, the instructor charming and the participants a hoot. A great combination for a weekend class. I did several things I had never done before. I wove this tapestry from the back. I wove dots and I used bobbins. I really liked the bobbins better than the standard butterflies which always seem to come apart when I use them for awhile. It seems so neat and tidy to have those bobbins hanging down from the tapestry when not in use. I will look for those in Visalia. Weaving from the back was new. A new habit I picked up while weaving from the back was tidying up the warp ends which would be facing me all the time. I hate a messy foreground while working. Plus, much less clean up at the end of the tapestry. Whenever I wanted to see what the tapestry actually looked like I had to turn the loom around, walk around to the front or peek into a mirror. It was an interesting feeling...not sure if I like or dislike it. 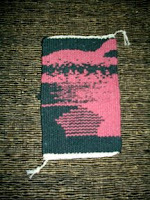 I may try a couple of my next weavings from the back and see how they turn out. At times it was difficult to see where I was in my weaving or where I would want to put a specific dot but otherwise it seemed OK.
We did three types of color blending as you can see working from the bottom up. First was hatching were we mimicked an outline of a barn like structure. Then I did a blending with four bobbins with different combinations of colors. And the last was using dots to blend from light to dark to light. All in all quite useful and will use all in future weavings. Great weekend...and I am ready to start weaving tapestry again. The participants a hoot? Hmmm. The charming teacher asked me to tell you she thought maybe 4 strands of your silk would have worked at least as well. I liked those bobbins too -- maybe we'll have to fight over the winder. Good idea about the four strands of silk. Perhaps the piece would have ended us less cardboard-like and have less tendency to push out at the edges. In the past, I've had pull in...can't remember much push out. I'll try four strands on my next piece with this yarn.